Annual reports are a comprehensive report on a company’s activities over the past year. As such, they can be dry and tedious to read. The right imagery and a talented team of graphic designers, therefore, are critical to making an annual report something special: at once a showcase and a way to powerfully communicate the company’s core mission and impact. I’m excited to be able to share the results of a collaboration with Portland-based branding firm Visible Logic last year: annual report images for the Maine Technology Institute (MTI). MTI offers funding (primarily loans and grants, but also investments) to innovative Maine companies for research and innovation projects. To date, they have funded more than 2,000 projects across the state and invested close to $230 million. 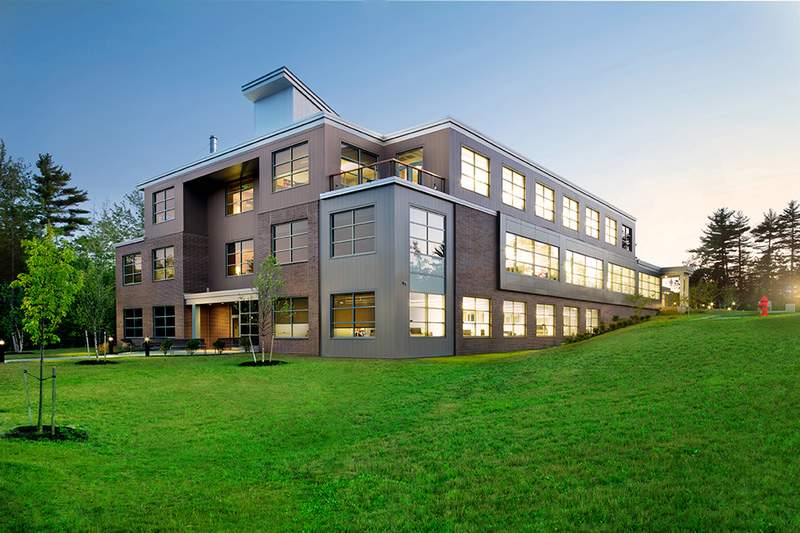 Tyler Technology’s new expansion at their Yarmouth campus totals more than 94,000 square feet. Happy to be able to show some of the work I’ve been doing for Freeport-based Zachau Construction. 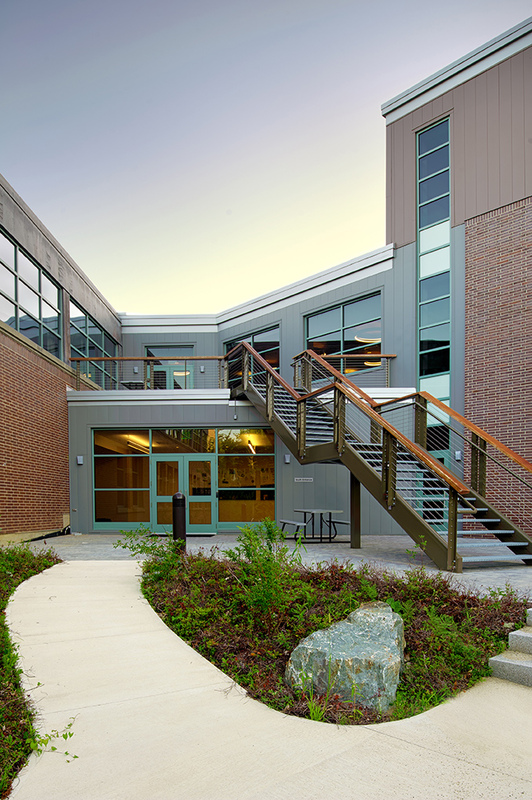 They recently had me photograph the recently-completed $24 million expansion of Tyler Technologies’ Yarmouth, ME campus, looking to capture the unique feel and design both inside and out. Architecture seems like a departure from my portrait work, but I think it’s not as different as it seems. Location and context have always been key components of my work, whether featuring people or spaces (sometimes with people in them). 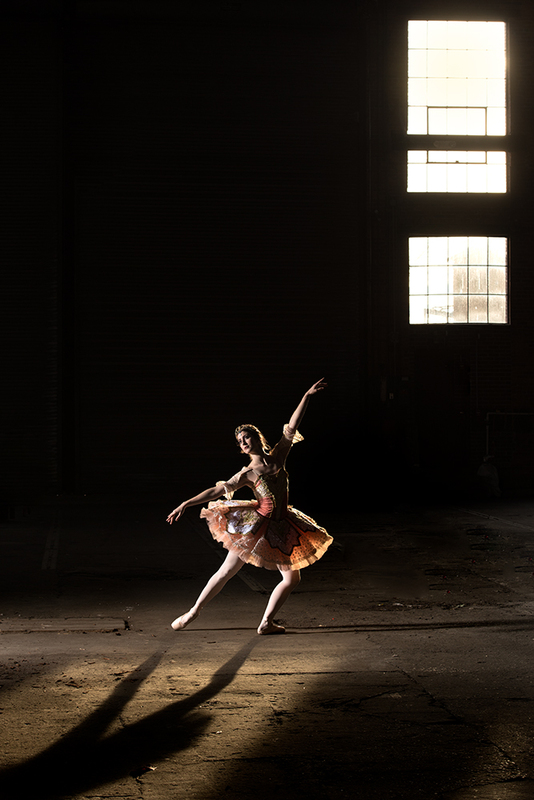 Creative use of light is always an important element as well, as is the combining of existing, ambient lighting with flash in an artful, storytelling way. Buildings and spaces tell stories about the people who design them, live in them and and work in them. The process of architecture work is a bit different, and often more technical, than portrait photography but the goalto convey a mood and a feeling, and to capture a moment. 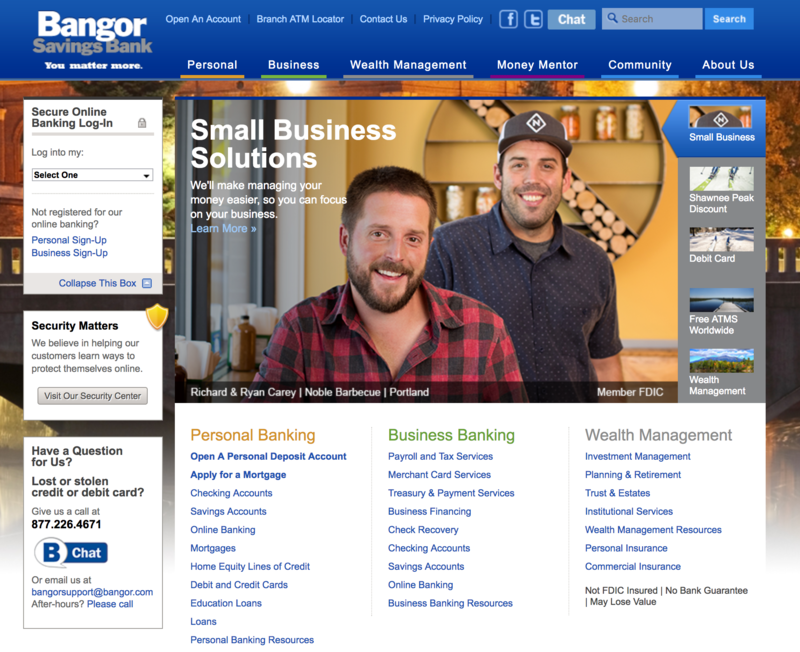 Over the past year I’ve been lucky to work with Bangor Savings Bank on a variety of shoots showcasing their small business customers from around Maine. 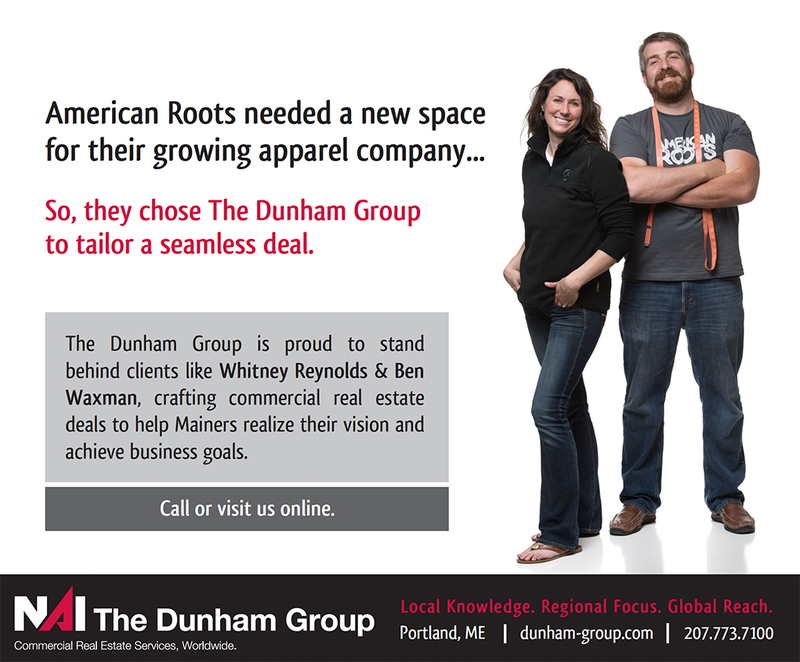 If you’ve ever been into a Bangor branch in Maine, you’ll have seen images of their business clients prominently displayed. When I first moved to Maine I remember loving their campaign because it showed real Maine people in authentic, real ways. In truth, that campaign is the reason I choose to step through their doors and opened my first business checking account, way back when. I’d guess the campaign still inspires people to sign up for accounts, just it did for me. I’m excited to be able to show off the first of the images—taken of Ryan and Richard Carey, owners of Portland’s Noble BBQ last summer—featured on the Bangor website this week. The brothers were fun to work with and their barbecue sandwiches, incredible. When your client is a marketing agency, things tend to get interesting. I’ve had the fortune to work with a bunch of great creative types at agencies small and large, and I find that collaborating with a talented team of creatives leads to great results. iBec Creative is a Portland-based web design and development agency that I’ve worked with several times over the years on various client projects—always a fun experience. 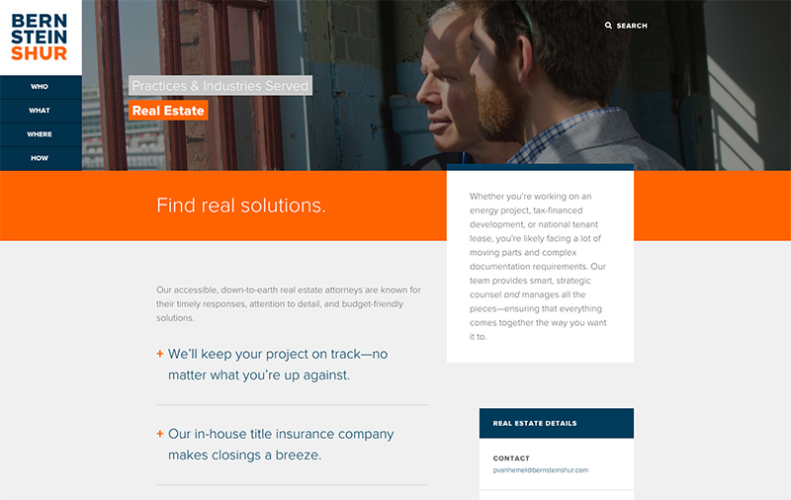 Recently they hired me to produce creative portraits of their own team for use on their newly-redesigned website. It’s one thing for a creative agency to choose you to photograph for their clients, and another when being hired to photograph the agency itself. Given the many talented photographers iBec has worked with, I was honored to be asked to help. iBec already knew the look they wanted: contemporary, fun and with a fashion sensibility. They opted to be photographed on white seamless in the studio. The lighting was simple, but purposeful: dramatic and directional, casting shadows on the background. Basically, it was like photographing a fashion shoot, but with less fans, stylists and featuring coders and programmers instead of models. The idea was to photograph real moments, rather than static, overly-posed formal shots. The team did great (even those who probably don’t love having their photos taken). 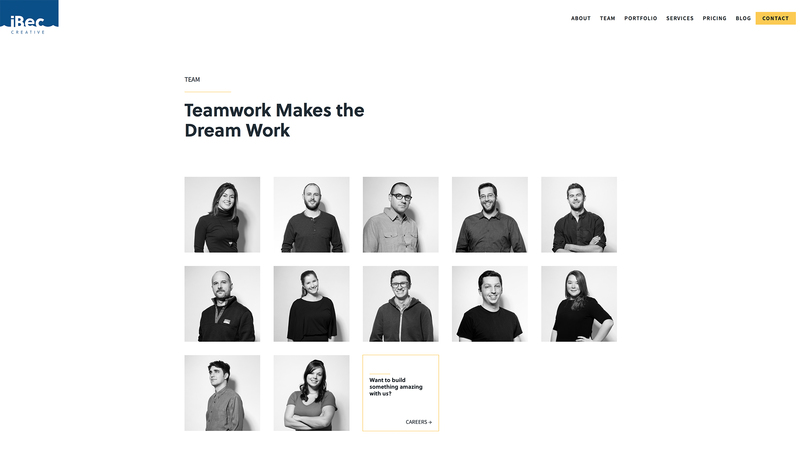 I love the variety of shots we got, and like the way iBec used them on their site: a black and white grid, overlaid with patterns that reference the areas each member specializes in, from web design and development to application prototyping to digital marketing. 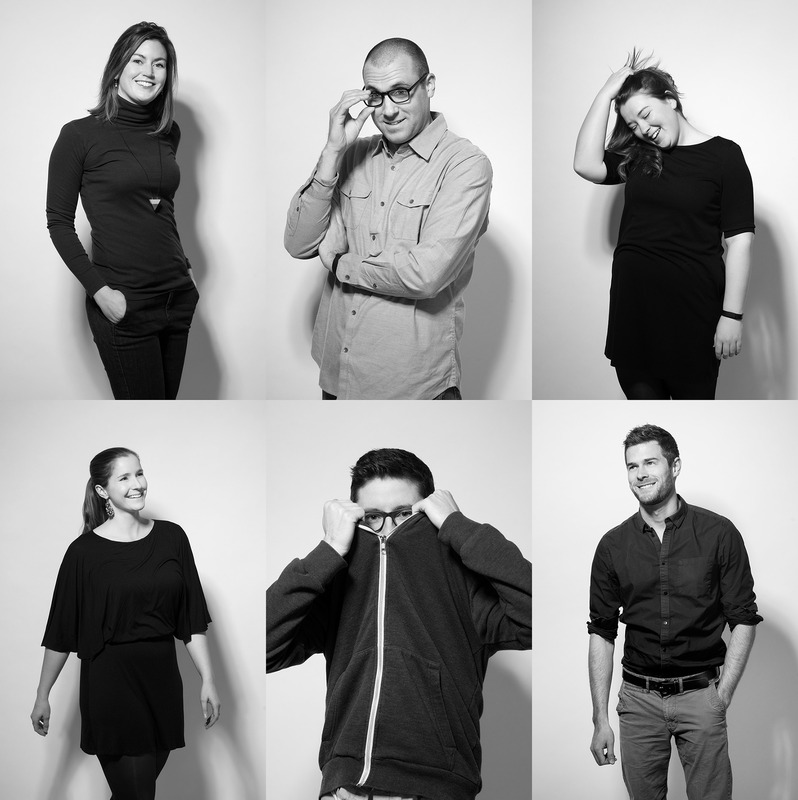 The team page reflects the cool people and personalities that make iBec tick. See more of the images, below. To see more of my work, including many more creative portraits–please click here to visit my portfolio site, Fitzgerald Photo. Thank you! Having a camera is like having a Golden Ticket into the lives of others. It’s opened doors on people, experiences and places that otherwise I’d have never met, done or seen. It’s an honor to be allowed into peoples’ lives, and it’s a trust that I hold very sacred. That’s why I was so excited that my camera recently opened another door: one that led to the Freemasons of Maine. I was chosen to produce an initial set of images for a website redesign the Grand Lodge of Maine has been planning for some time. I should note that my sum of knowledge of fraternal organizations stems from brief visits to my father’s Elk Lodge as a kid and a long-ago viewing of the movie National Treasure. I’m pretty sure neither qualify as research. 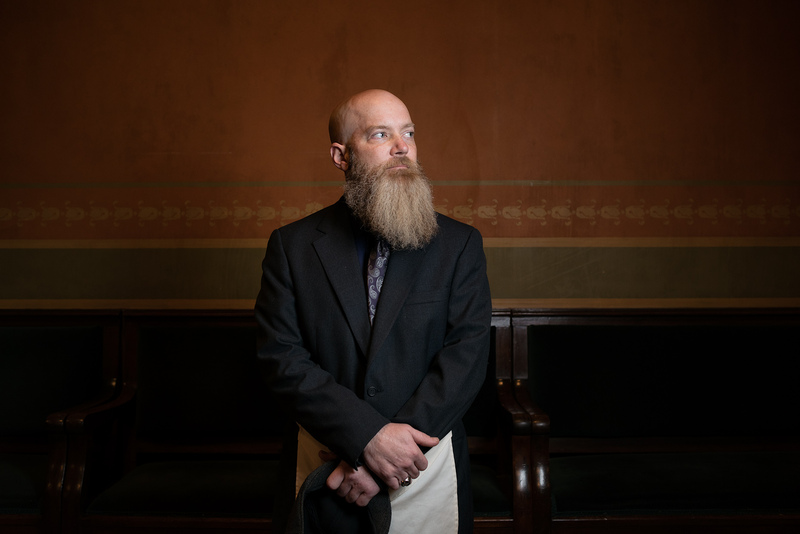 I was eager to meet real Masons and photograph some of the actual ceremonies in Portland’s gorgeous Masonic Temple. Freemasonry has a long and storied history in Maine, with roots going back to the first lodge, chartered in Falmouth in 1762. Portland’s Triangle Lodge 1 still has their original charter, signed by Paul Revere in 1796 (yes, that Paul Revere). 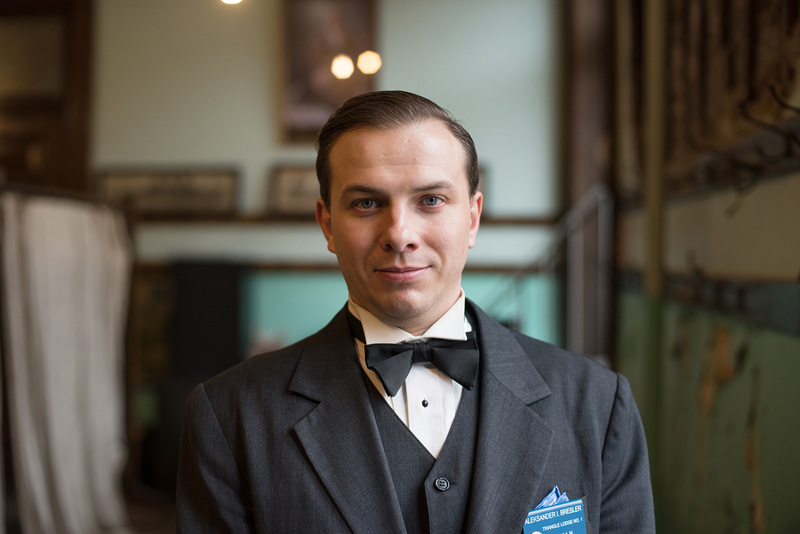 The Masons still attract men—young and old—drawn by the many traditions and looking for camaraderie, connection and brotherhood. You might not have suspected as much, looking at the Maine Masons website, which was in need of a redesign and new visuals. Most images they had showed members in tuxedos, wearing Masonic aprons in a formal lodge setting. Although I did photograph some of these same things, one important part of the project I’ve done so far with them is a portrait series of Masons in Maine, both in and outside of the lodge setting. 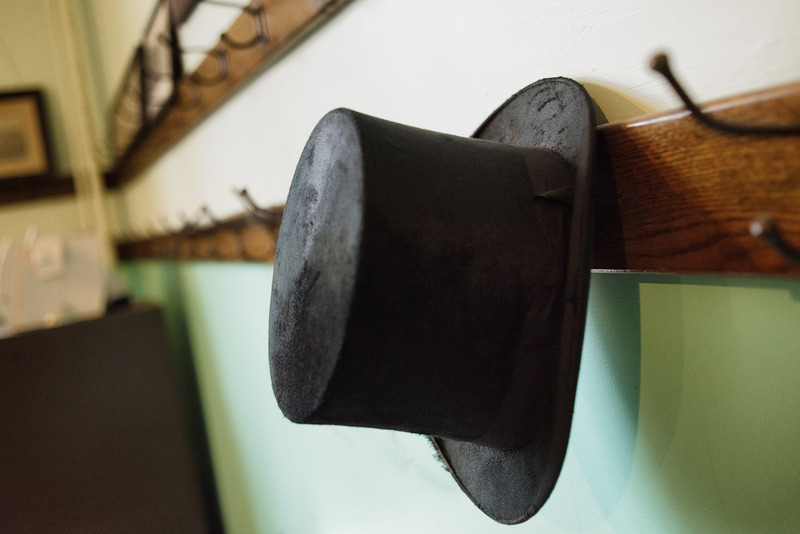 Work is ongoing, but I’ve had a great time so far meeting with the members and learning about the organization–a peek behind the velvet curtain, so to speak. What I found was a thriving group of individuals of all ages who are devoted to each other and to their community. I plan to be able to add additional images soon. One of the greatest tools in a location portrait photographer’s toolbox is the context provided by the shooting location. For example, a portrait of a person standing in a long hallway covered in glass windows. 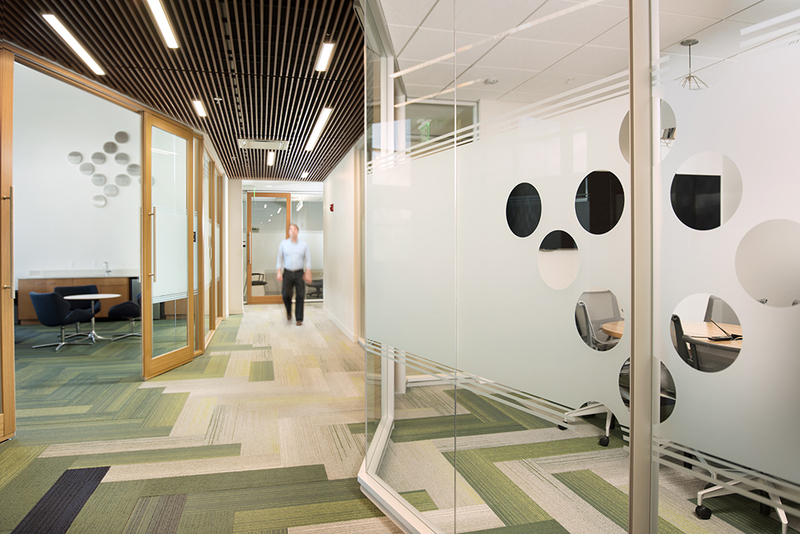 The environment—the glass windows and long hallway—conveys potentially important information about the subject. It also gives the final portrait mood—in this case it might be bright, open, cheery, confident, clean, modern and contemporary. Obviously, the right background is extremely important to a portrait. It does a lot of work that propels the portrait or the image..or, conversely, can sink it. The “environment” part of an environmental portrait is so critical that I think of it as the second character in the room—equally important, in terms of attention and consideration, as the human subject in the frame. Backgrounds are very important, but photographers can’t always rely on having them. Often, the backgrounds convey the wrong information, give the wrong mood, or need to be mitigated and modified. Sometimes, the background is intentionally removed from the equation entirely. This was the case with a recent shoot. 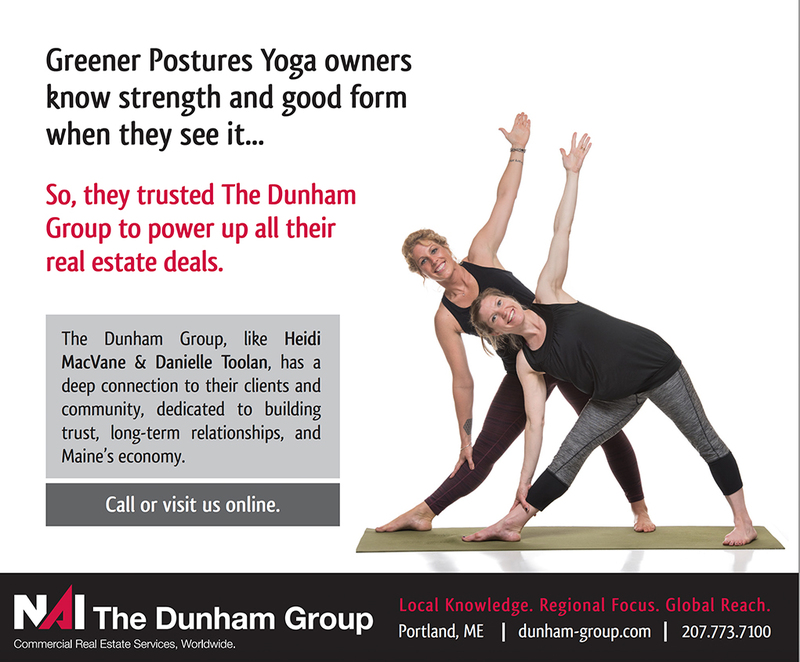 I worked with Maggie Hoople of East Shore Studio & Print on an ad campaign for NAI The Dunham Group, a large commercial real estate broker based in Portland, ME. 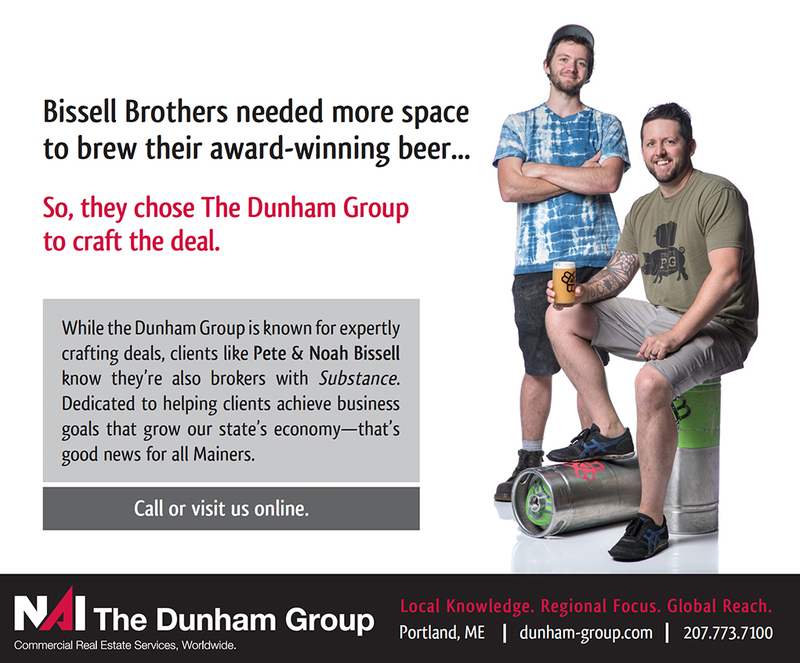 The ads would feature the owners of interesting Maine-based businesses who leased their commercial spaces with the Dunham Group’s help. We’d done the same campaign previously, featuring solo individuals. 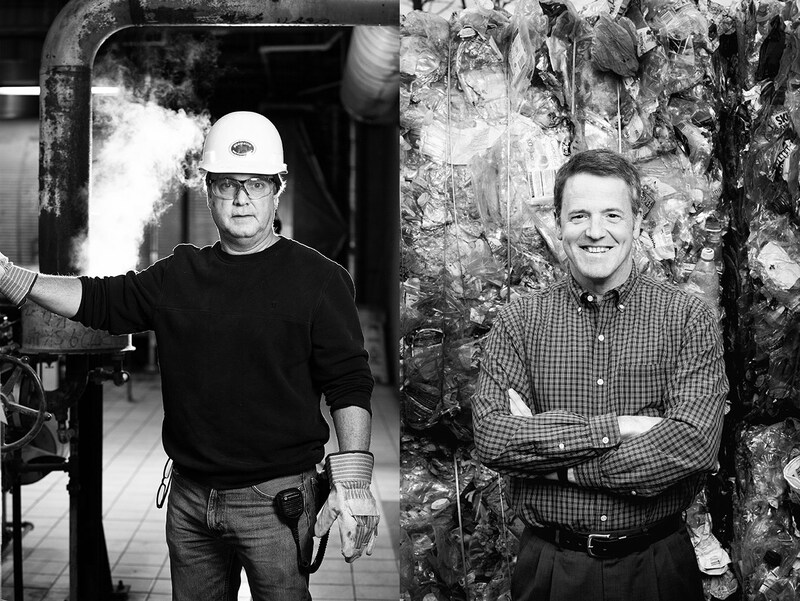 This time, each image would feature the two partners who ran each business. Since these images would be used in a variety of ways from print ads to large displays at the airport, on buses and elsewhere, they would need to be photographed as full-body portraits on a white seamless paper background. I’d have to rely on really engaging with the subjects since the mood and emotion of each ad would have to come purely from them. The bright white background, though featureless and without context, still would convey a bright, optimistic, clean and modern look. It was a fun shoot. Business owners are fascinating people, by nature optimistic, dynamic people who have a passion for what they do. 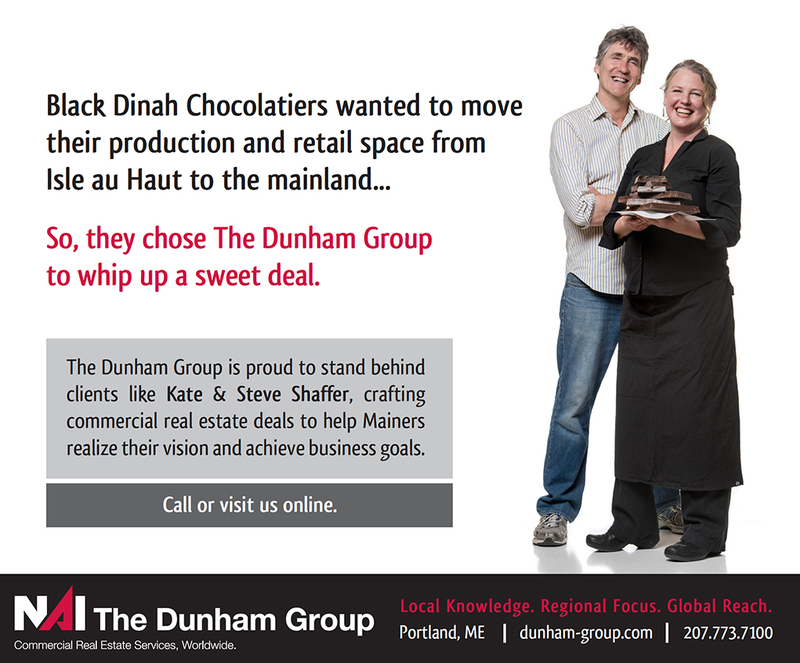 People like Kate and Steve Shaffer from Black Dinah Chocolatiers, Peter and Noah Bissel of Bissel Brothers Brewing, Heidi MacVane and Danielle Toolan of Greener Postures Yoga and Ben Waxman and Whitney Reynolds of American Roots. The shoot was an exercise in making them feel comfortable enough that they could forget about the background, and the lights, and the setting, and to focus instead on their accomplishments, their motivations and their business plans. Having two people in the frame provided a great opportunity for interactions, too, leading to serendipitous, unscripted moments, and key props and clothing helped give clues that the background couldn’t provide. So without the context of a background, it’s an opportunity for photographers like me to dive in and go deeper with my subjects. Freed of obvious visuals, the challenge and the reward comes from telling a story through moments that change from second to second. To me, that’s what it means to be a photographer of people. It reminds me that even when there is an interesting background in the frame, the focus should always be on the people in front of the lens. The emotional impact of the portrait comes from them, and that will make an image fly or fail no matter the background. The second in my series, “Beauty in Unexpected Places,” takes us to Building One of the Portland Company’s historic complex in Portland, Maine. 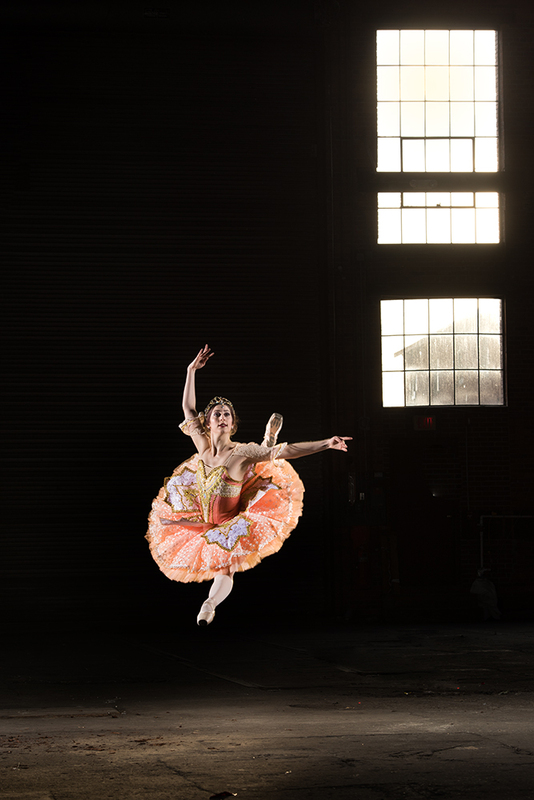 Savannah Lee is a dancer with the Portland Ballet Company and is wearing a tutu from a production of the Nutcracker. 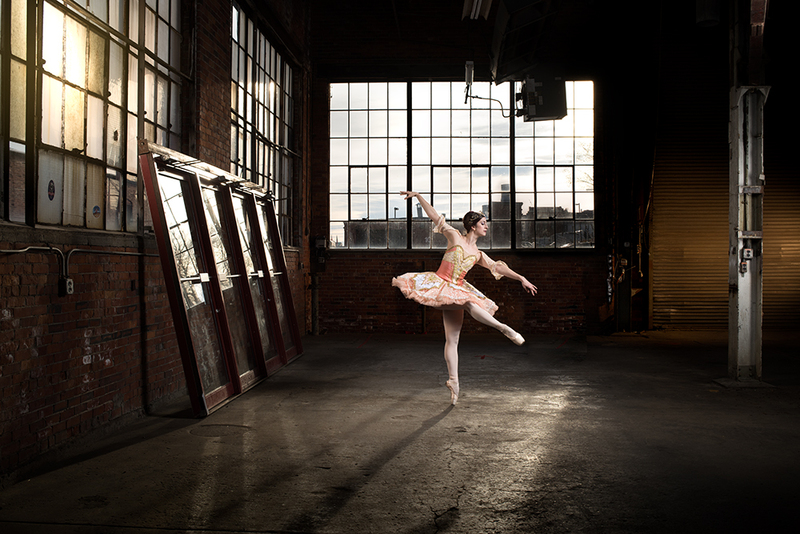 I love the look of the space, which contrasts so well with the intricate ballet costume. The challenge was to light enough of Savannah to set her apart from the environment. I also had to light key elements of the large space around her while not over lighting, in order to preserve the character and mood of the environment. I think the best images happen when you let things happen, to some degree. Definitely a guiding motto is: “Set the stage, but let the pieces fall.” So we planned the lighting and envisioned the scenes, but I encouraged Savannah to move and perform as she felt appropriate. In the end, a great artistic collaboration in a historic part of Portland’s past. With location shoots there’s always an unexpected wrinkle, and an unexpected gift—the gift that the photo gods give you when you show up, repeatedly, to do the creative work you should be doing. A few days before the shoot, the space was booked by the Portland Fire Dept. to do training drills. We arrived not knowing what portion of the space—if any—we’d be able to use, but were determined to make it work regardless. We showed up and the fire department didn’t, due to a last-minute schedule change (Had they done so, I’m guessing we would have somehow incorporated them into at least one shot). That was the gift. The wrinkle? The cavernous location was very, very cold, with a concrete floor—exactly the opposite of ‘ideal conditions’ for a professional dancer. Thanks, Savannah, for making it look easy and being a great sport. A true pro. A unifying theme of my work can be boiled down to, “people who work”. The people in front of my lens tend to do interesting things for a living, and my job often is to show them going about their duties. In the course of a week I might find myself in the cab of a delivery truck, perched on a platform above a factory floor, or scrunched into a corner of a conference room, camera in hand. ecomaine is a waste management non-profit in Portland that generates power from the stuff the rest of us throw away. I’ve photographed their people for years and I absolutely love working there. As a location, it’s often dirty (they process and burn garbage, remember), the lighting can be an extreme challenge and the environment tends to be either freezing cold or stiflingly hot. But….on the other hand, they have cool smokestacks, pipes, walkways and big pieces of colorful moving machinery. Sign me up! Recently they had me document and photograph many of their people at work and I wanted to show some of the results of that ongoing project. Produced completely in black and white, the images look timeless and give a human dimension to the industrial facility. Instead of the more intensive scenario-based images I might create in other settings, these are ‘quick-hit’ portraits done in work areas all over the plant and buildings, with minimal lighting. Basically, I have a lot of fun and get a workout at the same time. 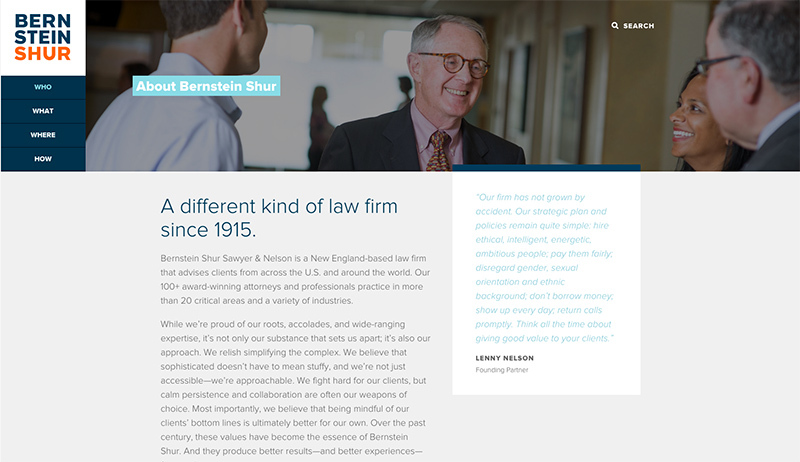 One of the largest single projects I’ve had the pleasure of being involved with over the past year was a branding redesign for Maine-based law firm Bernstein, Shur, Sawyer & Nelson, P.A. I was contacted by Thinkso!, a New York creative agency, to produce all of the imagery for a comprehensive rebranding effort. 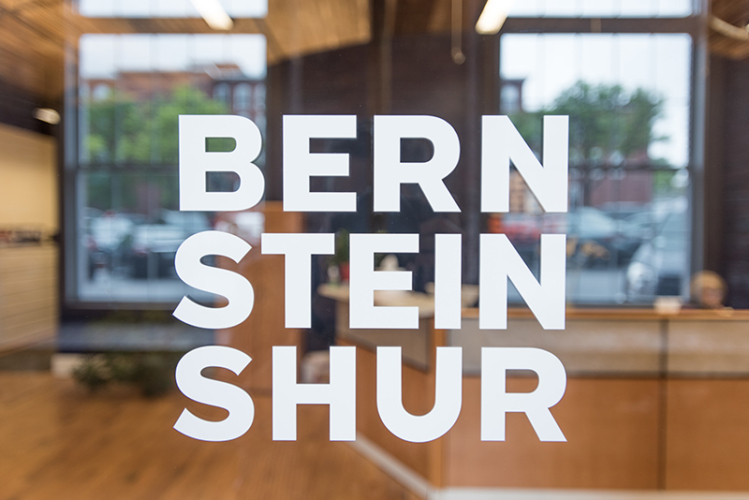 Working with their creative team and with the amazing people at Bernstein Shur, we photographed all of the firm’s attorneys in Portland, Augusta and New Hampshire. We also spent time with several of the firm’s clients, photographing their operations over the course of several months. 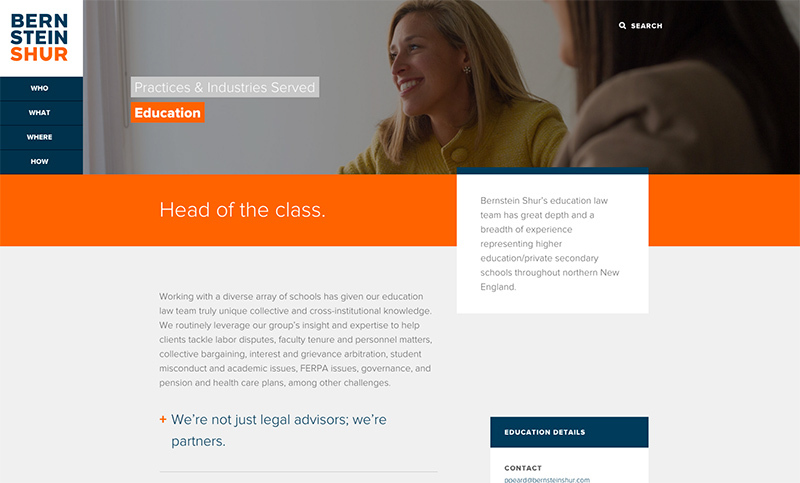 This project was unique not just because of its scope and size, but also because of the opportunity to work with Bernstein Shur’s clients in the course of showing the deep relationships involved. The rebrand was rolled out at the end of 2015 and looks amazing. I’m grateful to have been a part of such a monumental effort and for the chance to visually tell the story of this proud Maine firm. See below for examples of the work in action. Maine is beautiful, but winters can be a bit…tiresome. Spring in Maine usually just means heavier and wetter snow. 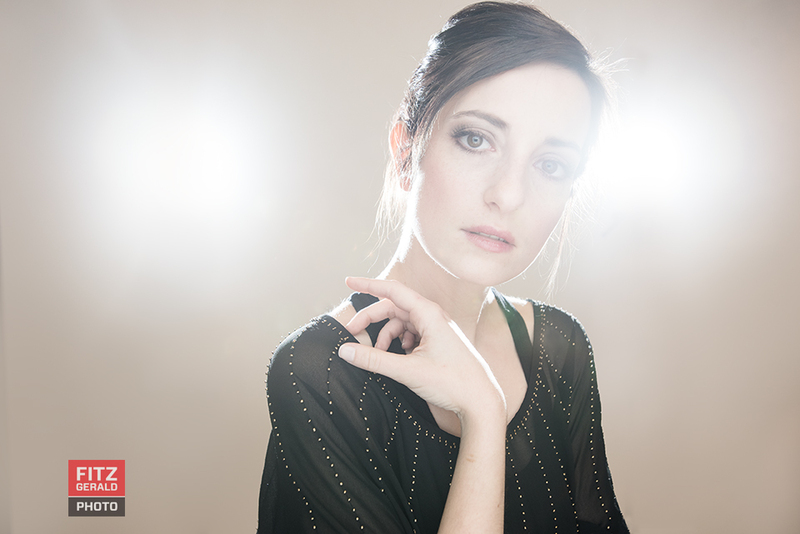 Of course, that makes this season a perfect time to stay in the studio and play with light a bit. The following images are just a few I really like from a recent shoot with local model Ivett Toth (styling and makeup by Brianna Rothman). 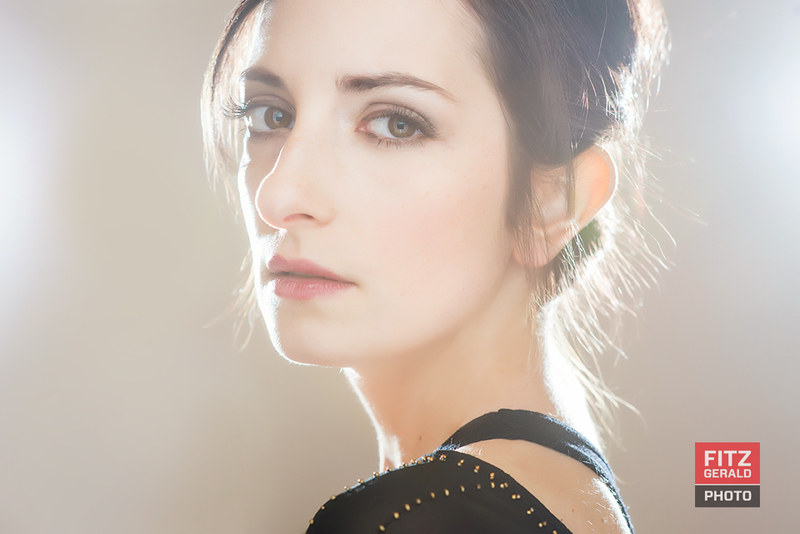 Ivett was amazing to work with and I love the ethereal look to her final images.